The clothes dryer is a staple in the majority of American households, but the heat-it-up-and-tumble method is sorely inefficient and extremely expensive. 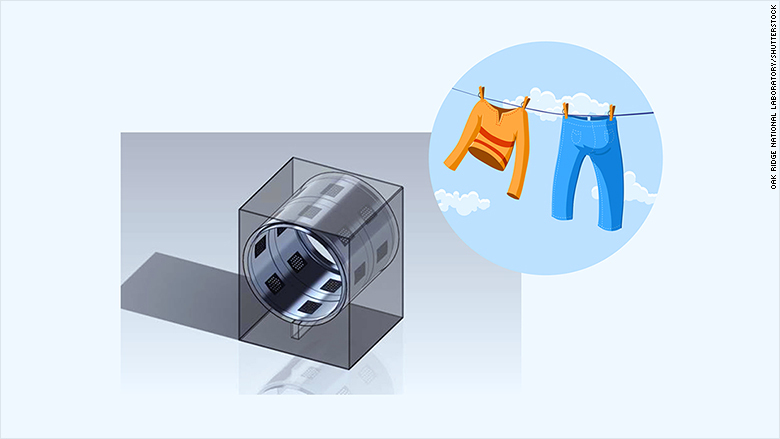 A new ultrasonic dryer concept forgoes the heat, instead using high-pitched vibrations to wick moisture from clothes in a method that's cheaper, faster, energy-saving and better for fabric too. A full-sized prototype is on track for completion by August, according to head researcher Ayyoub Momen -- which will kick off the path to the consumer market through partners like General Electric. Momen expects the ultrasonic dryer will cost consumers as little as $500 and will cut down on the whopping $9 billion Americans spend to power their dryers every year. "Evaporating water with heating elements, [like] commercial dryers do, is energy-intensive no matter how you design it," Momen, a researcher at Oak Ridge National Laboratory in Tennessee, told CNNMoney. The ultrasonic concept is, "just displacing the water with a low-energy, high-frequency vibration." Instead of the traditional heating elements, Momen and his team's ultrasonic dryer uses electric devices called piezoelectric transducers that emit sounds so high-pitched even Fido can't hear them. The sounds cause vibrations that shake the wet fabric so vigorously that all of the moisture can be extracted even in cold air. That water is turned into a mist and collected in a little tank for the user to drain later. The ultrasonic dryer is three to five times more energy efficient than existing consumer options, and it's able to dry full loads of laundry in 20 to 30 minutes versus the standard 40 to 60 minutes. The lack of heat also means less wear on the clothes, Momen said, which avoids fading and lint. Researchers test a "press" dryer model, which is shaped differently than the tumble-dryer-like prototype but uses the same ultrasonic technology. But Momen is most excited about the potential overall impact on the country's energy use. According to government statistics, about 85% of U.S. households have a clothes dryer -- and all that laundering consumes an incredible 4% of total residential energy use. 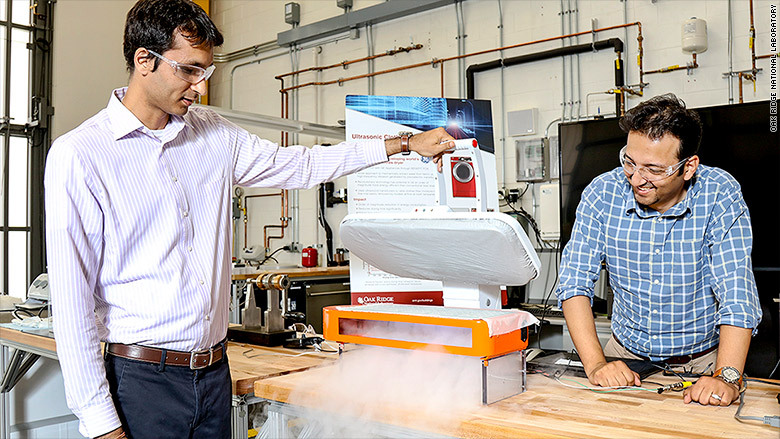 Momen, who developed the concept in response to a 2014 Department of Energy dryer-innovation challenge, modeled his creation on existing ultrasonic humidifiers and started by drying just quarter-size pieces of fabric. But over the next few weeks, he will finish a full-size prototype that can dry a full load of laundry. That milestone begins the ultrasonic dryer's journey to consumers, but Momen said the process could take about five years. He will work with General Electric to lower the costs, tweak the design and build production lines to manufacture the dryer. "Our estimate is it will cost about $500 to $1,000 for consumers, which is about the same as a premium commercial dryer right now," Momen said. He's careful to stress that General Electric (GE) will set the final cost, but "from the beginning we've known ... these have to be sold in the market to make a difference," he said. That difference is crucial to Momen, who called energy "one of the most important areas of research in the modern era." "You have the environmental impact, the cost and our country's [dependence] on [foreign] energy sources," he said. "We've got to make a change. And us, we're starting with this dryer."